Stay alert! Watch out for your great enemy, the devil. He prowls around like a roaring lion, looking for someone to devour. Stand firm against him, and be strong in your faith. Remember that your family of believers all over the world is going through the same kind of suffering you are (1 Peter 5:8-9 NLT). A final word: Be strong in the Lord and in his mighty power. Put on all of God’s armor so that you will be able to stand firm against all strategies of the devil. For we are not fighting against flesh-and-blood enemies, but against evil rulers and authorities of the unseen world, against mighty powers in this dark world, and against evil spirits in the heavenly places. Therefore, put on every piece of God’s armor so you will be able to resist the enemy in the time of evil. Then after the battle you will still be standing firm. 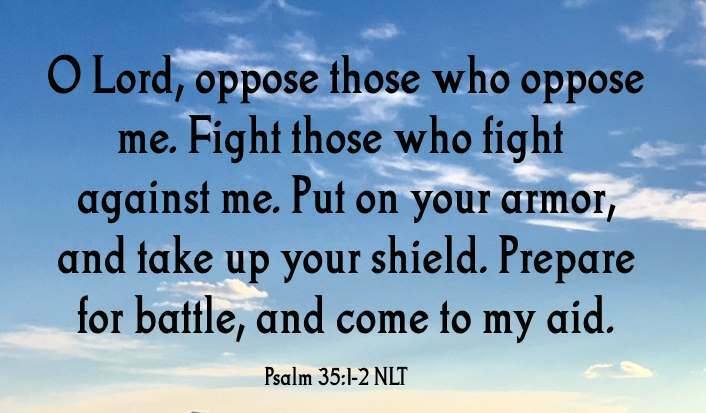 Stand your ground, putting on the belt of truth and the body armor of God’s righteousness. For shoes, put on the peace that comes from the Good News so that you will be fully prepared. In addition to all of these, hold up the shield of faith to stop the fiery arrows of the devil. Put on salvation as your helmet, and take the sword of the Spirit, which is the word of God. Pray in the Spirit at all times and on every occasion. Stay alert and be persistent in your prayers for all believers everywhere (Ephesians 6:10-18 NLT). 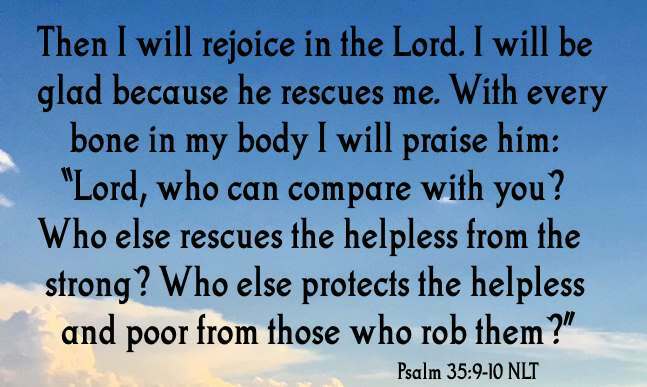 David gave us a powerful prayer that we can use for fighting against the enemy in Psalm 35. The key is not to read it, but instead, pray it! In the name of Jesus Christ, Lord please fight against our enemies every day of our lives.